As I mentioned at the beginning of the previous post, we had a list of birds we were hoping to see today, although we were well aware that it was still a bit too early in the season for some of them such as Woodchat Shrikes. 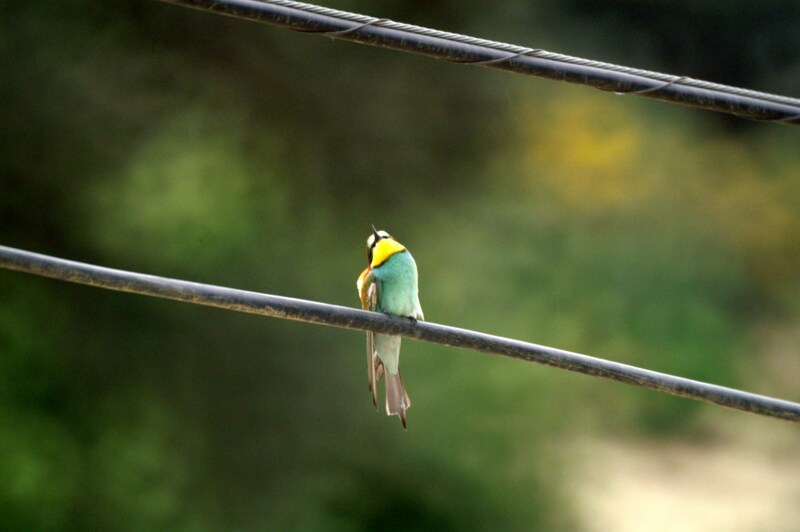 I had however already seen and heard Bee-eaters as they passed across my locality and we do know a few places where nest sites are located, so as one is near Jimena we made a diversion on our way back to see if the birds had already returned to it. Much to our delight they had and we spent a very happy half-hour watching them there. The nest site is on the side of a steep hill situated on farmland roamed by pigs and is devoid of any covering of vegetation such as grass or other herbaceous plants although there are bushes and small trees. 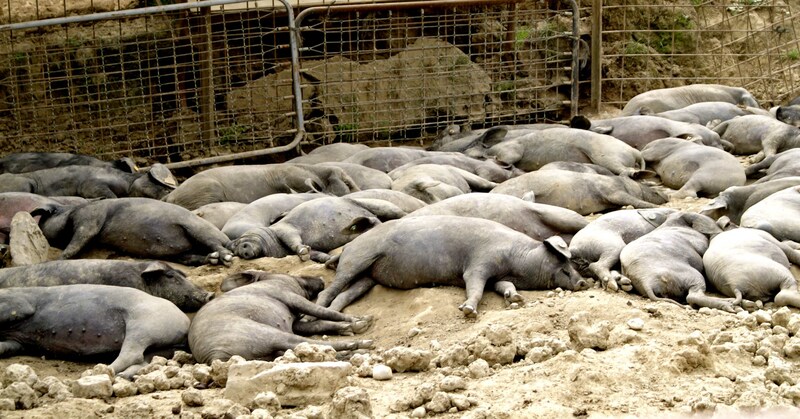 At the bottom of the hill is a penned area that was full of young black pigs, every last one of which was stretched out fast asleep in the warm sunshine. The soil of the hillside is light and sandy, so easy for the birds to tunnel into. We estimated that there were 20+ birds currently at the site, most of which appeared to be paired; a few single, younger birds were flying around, perching on power cables and on the rusty iron fencing. Newly arrived back at the site the birds were still restless and easily spooked. 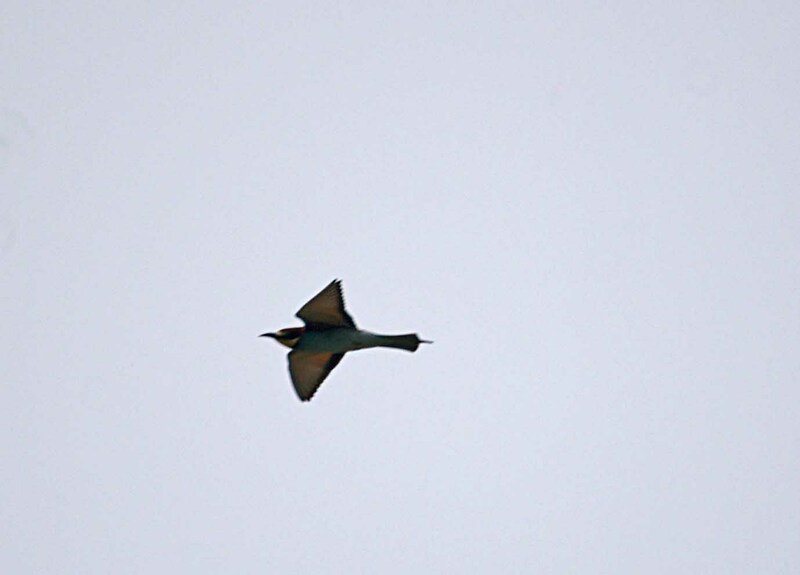 Once or twice something happened to cause them all to take to the air at once: on one occasion it was as a result of the appearance of another flock of Bee-eaters that flew in over the brow of the hill, circled around a bit then flew back the way they had come. Another disturbance was brought about by the close proximity of two low-flying Short-toed Eagles that were circling slowly over the area. Conservation status: European: 3 concern, depleted. Most of the population are not in Europe and their global status is of least concern. World distribution: S & C Europe, N Africa, S & C Asia. 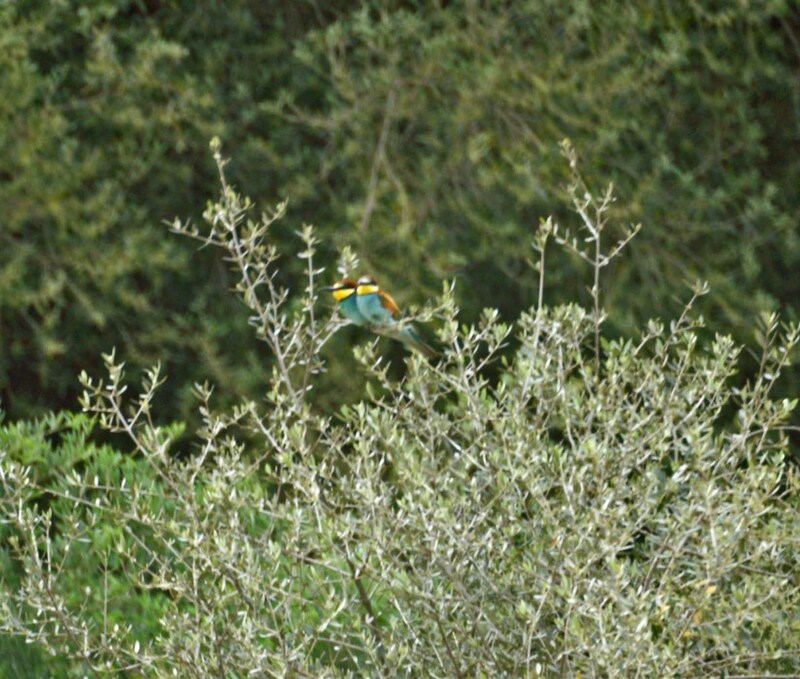 Bee-eaters winter in sub Saharan Africa and W India.The European population during the summer months is estimated at between 280-600,000 pairs. 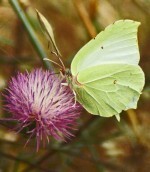 Habitat: Open country, woodland, farmland. Diet: Flying insects, especially bees and wasps which are caught on the wing; stings are removed by rubbing against a perch. 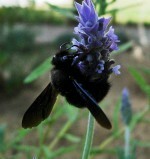 The birds require around 225 bees a day when they are raising their young. 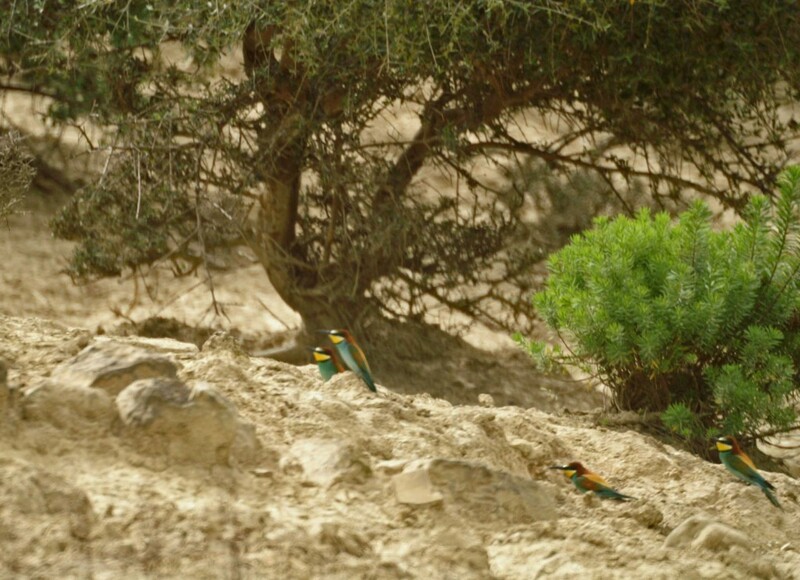 Breeding: Bee-eaters nest in tunnels excavated in suitable banks or cliffsides. 6-7 eggs are laid in a single brood; incubation takes 20 days and is performed by both males and females. Both parents also feed their offspring. 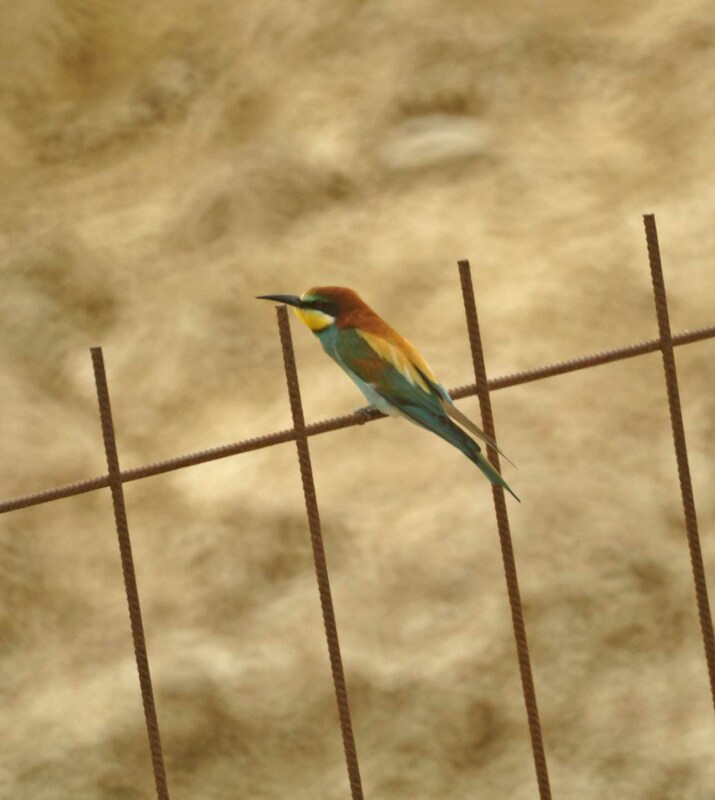 This entry was posted in Birds of Southern Spain, Cadíz Province, Jimena de la Frontera, Migrant birds, Wildlife of Cadíz and tagged Bee-eater, European Bee-eater, Merops apiaster. Bookmark the permalink.